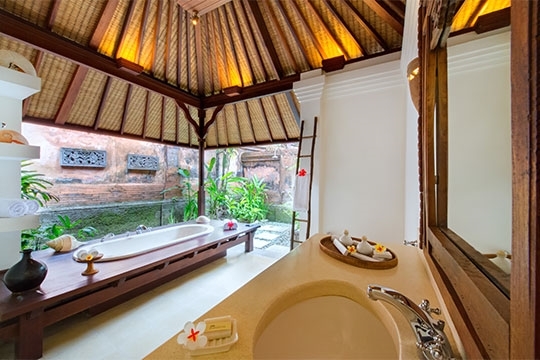 Immaculate and enchanting – the 3-bedroomed Villa Pangi Gita is a picture-postcard Balinese villa set upon old rice terraces stepping down to a pretty river. 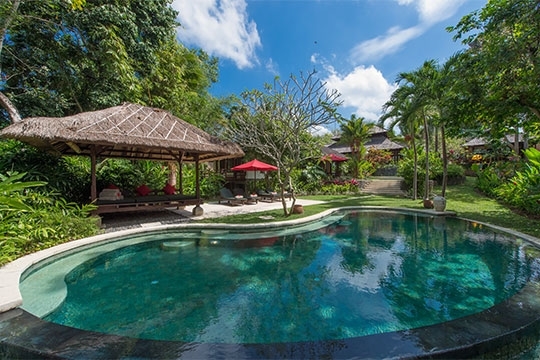 With its rural setting, charming service and lush green gardens, yet still close to the beach, this is one of the top small villas in Bali. 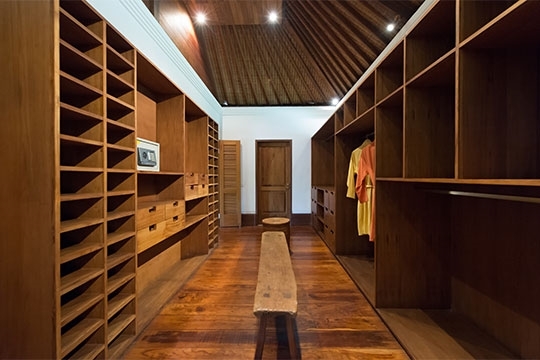 The 3-bedroom, family-oriented Villa Mako is an architectural treasure testament to the Dutch influence on Indonesia’s colonial past. 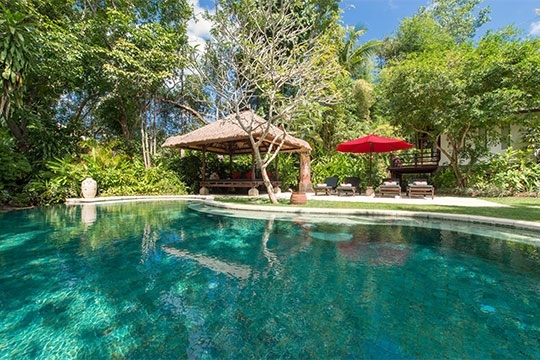 Fully staffed and complete with pool, gorgeous garden and stunning views, it rests within a traditional village, yet is close to the beach and only a short drive from Seminyak. Imagine a series of terraces, water trickling slowly down through fish-filled ponds towards the idling river below. Overlay a line of charming whitewashed pavilions roofed with ironwood shingles; gardens of ginger, heliconia, palms and ferns stepping down to an inviting free-form pool at the river’s edge; the sound of water spouting from intricately carved stone faces, and the distant music of a small waterfall: this should give you a good picture of the delightful Villa Pangi Gita and its rich green Balinese garden, waiting to envelop you in a sleepy calm – yawn! 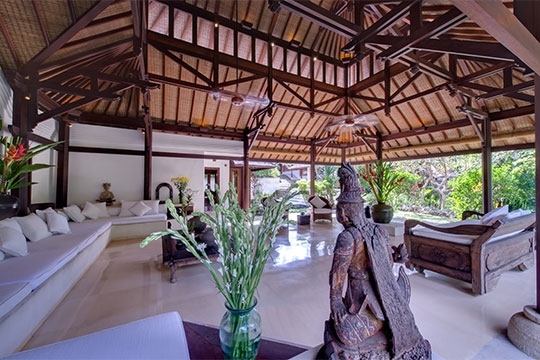 Immaculately maintained and finished, Villa Pangi Gita stands out as a beautifully designed villa very much in sympathy with its surroundings and its Balinese heritage. 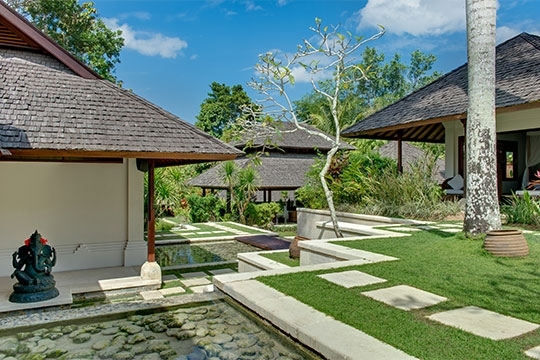 Each pavilion – wood floors, tall teak fold-back doors, stone walls and vaulted ceilings with woven bamboo linings – is spotless, courtesy of the dedicated staff. Antiques from around Asia provide an elegant touch of style. 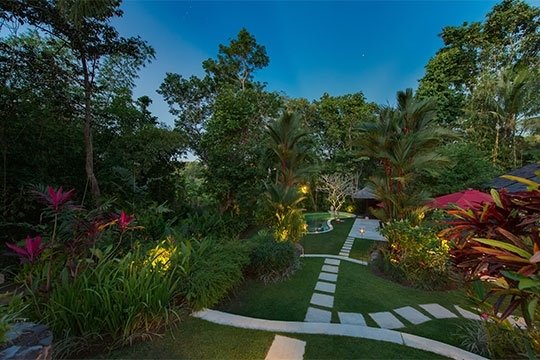 The three double bedrooms each stand alone with screens of thick foliage providing privacy; semi-outdoor bathrooms add a warm tropical feel. 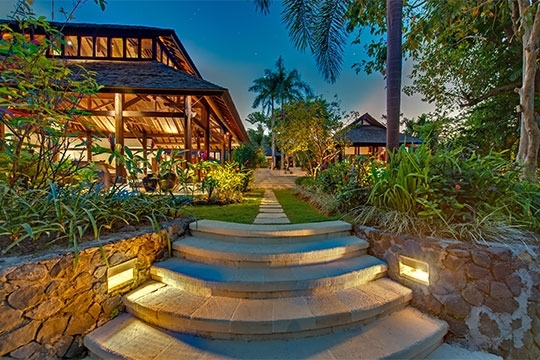 A study with large TV, a huge open-sided living pavilion, a handsome dining room and a simple poolside balé (gazebo) provide numerous places to eat, socialise and relax, but perhaps the best seat in the house is the single recliner on the deck overlooking the river and the paddies beyond. The surrounding village of Pererenan is tiny, yet the villa staff are drawn from here and nearby villages. Their broad smiles always accompany the service – whether it’s dinner in the raised dining pavilion with its elegant views of the gardens, breakfast at the casual kitchen bar, drinks in the living pavilion or on the private terraces that accompany each bedroom, or a chilled towel by the pool. 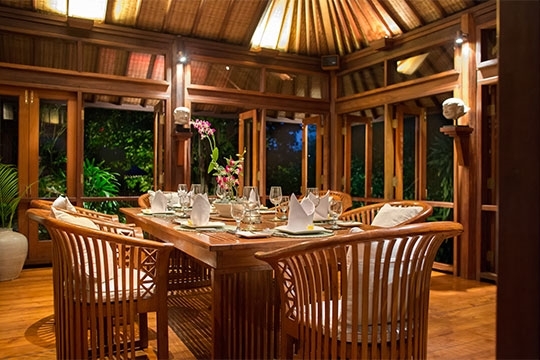 Pangi Gita's chef has been with the villa for years and prepares delicious local and international dishes from a large suggestion menu (groceries and a small surcharge of 20%++ handling fee are on guest account). This charming yet very discrete service together with the wonderful setting is sure to relax even the most hardened workaholic – expect to unwind here. 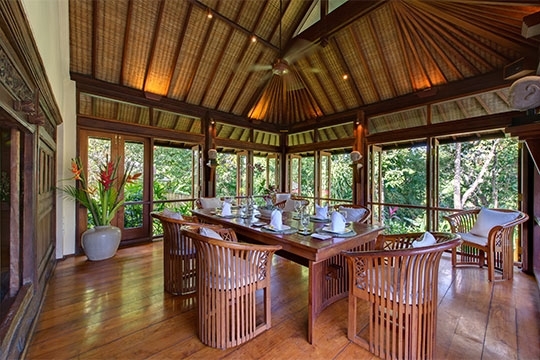 Pangi is the name of the river and Gita means ‘song’ – it’s a lovely name for a truly lovely villa. Even the most hardened workaholic can expect to unwind here. 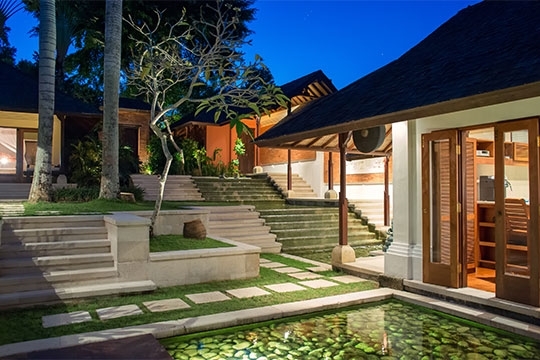 Stone staircases and stepping stones sunk into manicured terraced lawns lead from Pangi Gita's beautiful carved Balinese entrance past a series of pavilions down to the lagoon-like free-form pool at the river’s edge. 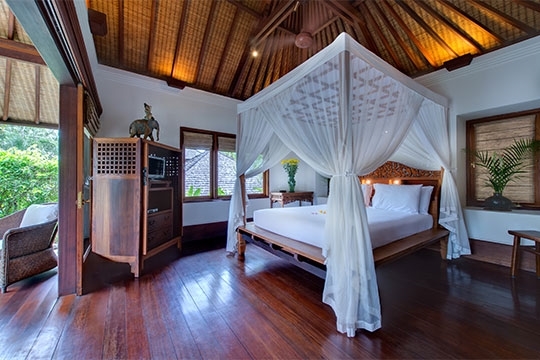 All three bedroom pavilions are air conditioned and feature 1 king and 2 queen-sized teak beds with mosquito net canopies, TV screens with DVD players and furnished terraces in front of each room. 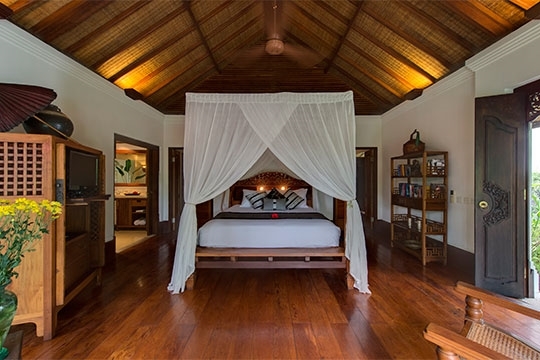 Vaulted ceilings lined with bamboo, teak framed doors and panelled floorboards give the rooms a lovely natural feel and contrast well with the encircling gardens. Uppermost in the grounds are the two guest bedrooms. Their ensuite bathrooms have tubs framed with teak and brass rain showers open to the sky, surrounded by lichen-covered brick walls over two metres tall for complete privacy – save the odd passing bird. 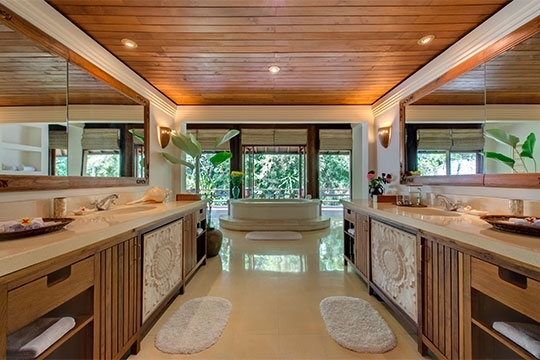 The master suite sits adjacent to the pool; heavy sliding teak doors reveal a large bathroom with a huge oval tub and separate walk-in shower. In a separate room off the bedroom is a very generous dressing area. 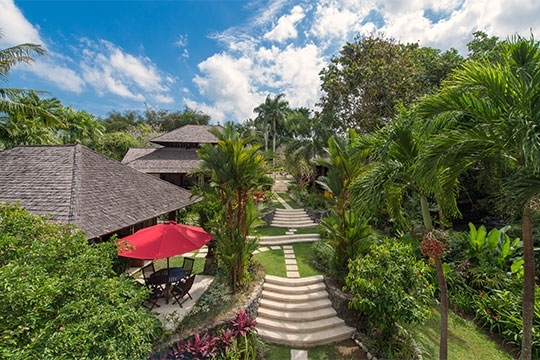 Between the bedrooms, at the centre of the villa, is a spacious, traditional wantilan-style living pavilion dominated by a serene Buddha statue and topped with a lofty two-tier roof for good air circulation – aided by overhead fans. Terrazzo floors and encroaching gardens keep it cool, while bamboo screens keep out the weather. Leading off the living room is the cosy air-conditioned study/TV room which opens onto fountains and water features. If you must work during your stay, this is as good a place as any to do it! Books are stored on the wall-length bookcase whilst a wide-screen TV with satellite connection and a good selection of DVDs and CDs provide entertainment for a rainy day. Opposite is the dining pavilion, raised up to admire the surroundings. 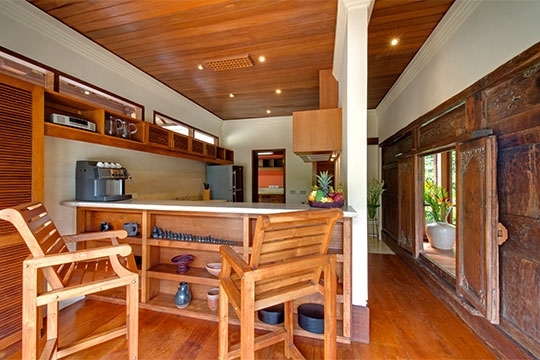 Teak-framed glass doors can be opened on three sides to let in the sounds and smells of the gardens, with a fan to provide cooling; alternatively the doors can be closed for air-conditioned comfort. Through a low-doorway set within an attractive antique wall panel, is a simple kitchen with a casual breakfast bar and top-class coffee machine! Discounts are sometimes available for booking last minute within 10 nights of arrival, or long stays with minimum of 14 nights (please note in cases where more than 1 discount is available, the higher discount shall apply for each booking). For discounted rates click on the Check Availability button and enter your dates or contact Customer Service. 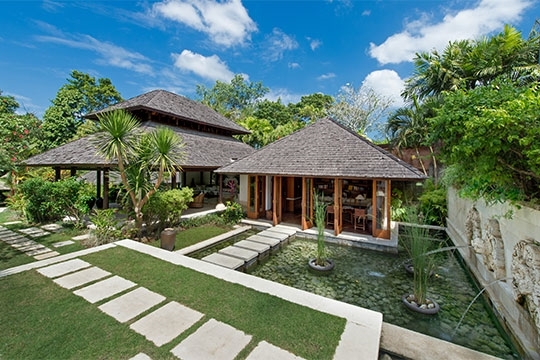 The managing agent of the villa charges a USD100.00 fee for each change after a booking has been confirmed. 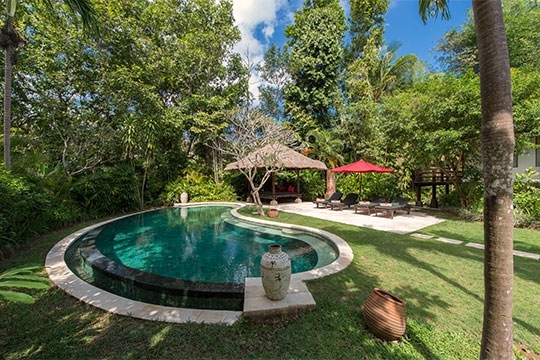 3 bedroom villa located in Canggu, Bali. Ideal for Beach in ten, Body and soul, Bring the relatives, Going for golf, Fair share for groups, The great outdoors, Romantic retreats, Room with a view, Rural escape. 9 out of 10 based on 65 user reviews.